Paliam Palace is a 450 years old house and one of the architectural splendors of Kerala which used to be the the residence area of Paliath Achans the Prime Ministers of Maharajas of Kochi. 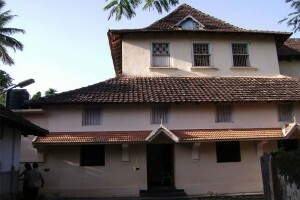 It is located in Chendamangalam town of Kerala and houses collection of historic documents and relics. It is a great Muziris Heritage Site . During Portuguese invasions the ministers have shifted the King to this place who then used to lived here . The building features, elaborately carved wooden staircases and balustrades and thick walls with splayed openings and have an influence of Dutch style of architecture. Dutch renovated this palace and then presented it to the Paliath Achans for their service to their Kings.